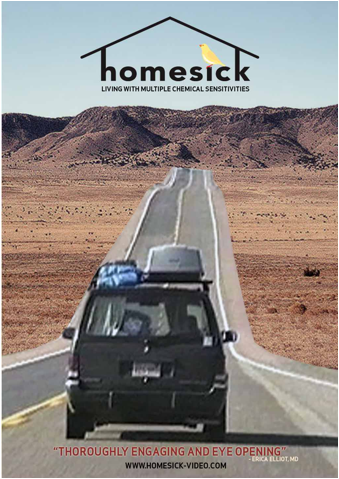 Homesick is a tour of the many forms of housing used by people with multiple chemical sensitivities (MCS) in the American Southwest, and the stories of the people who moved there. When people get sick with severe multiple chemical sensitivity (MCS) a central problem is often what to do about housing. Regular housing makes people with MCS sick with symptoms that resemble having both the flu and too little sleep. The only way to improve on that is sometimes to move to a non-toxic house — or sleep outdoors. Susan Abod is a singer, songwriter and recording artist in Boston. She performs in clubs and hopes she can become a fulltime professional and quit her daytime job. But MCS and chronic fatigue gets in the way. 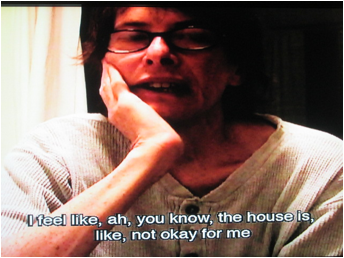 After several years, Susan gets a grant to make a movie about the MCS housing situation. 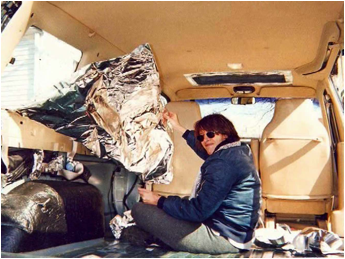 She hires a camerawoman, modifies her van so she can sleep in it and takes off for the Southwest USA to see what people have done to create housing they can live in. Modifying the van so Susan Abod can sleep in it. The camerawoman stays in motels, while Susan sleeps in her van outside and just uses the bathroom in the motel room. This usually works well, though sometimes they have to look at multiple motels to find one with little outside air pollution. They arrive in Wimberley, a rural area east of Austin, Texas, where several people with MCS have settled. The climate is mild year round and some of the houses are built with large screened areas for maximum ventilation of clean outside air. Then it�s on to visit more people in the area around Prescott and Sedona in Arizona. Here we both see some of the houses and hear stories about how people�s lives have been wrecked by the illness, but also how finding safe housing has made their lives better. We get the story of one small boy who was so sick he might have died if his mother had not intervened, despite the old-school doctor�s insistence that he couldn�t possibly be made sick by pesticides. We now see the boy looking and acting like any normal boy, but he is a prisoner of their home, and has to be home schooled since pesticides are used everywhere in this upscale community. Most of the movie takes place in northern New Mexico where we see a lot of contrast in people�s living situations. We meet two professionals, an architect and a physician, who have had beautiful houses built of healthy materials in the style of Santa Fe. Both of them have been able to work again, since they are self-employed and can control their work situation. 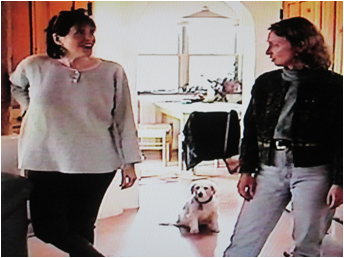 Susan Abod (left) visits architect Paula Baker-Laporte in her beautiful safe home. Susan feels so good with the plaster walls in the Baker-Laporte home. One woman can�t afford a healthy house and sleeps in a teepee. We also see how people who do not have the financial means to build a healthy house have to cope. One owns a regular house she has improved on, but still has to sleep in a tent and a teepee out in the yard, despite the brutal winter. Another has lived in a van for a long time, though recently was able to rent a room from another woman with MCS. 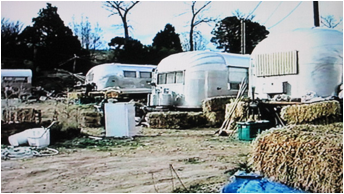 We also visit an MCS trailer park near Questa, New Mexico, that looks very depressing. The owner tells about all the suicides, but also the many people who have used the trailer park as a stepping stone to something better. The park has since been closed, as the owner died. The Questa MCS trailer park. It has since closed. Susan Abod says she likes the Santa Fe area the best because of the active MCS community there. If she had to move away from Boston, she wanted to move to Santa Fe. Susan returns to Boston to her own somewhat safe home, but it isn�t safe enough. Her health declines over the next couple of years and she becomes nearly bedridden. Her doctor encourages her to move to a dry climate to get away from all the mold. When she hears that a safe rental is available in Santa Fe, she packs up and moves. The rental is a small cabin (casita) that was built for people with MCS, but as it often happens, it was not done well enough. The owner couldn�t live in it, so it became available for rent. Susan can�t even spend the night. She is determined to make it work and tries in various ways for three months before she gives up. Despite the housing problems, Susan notices she feels better in Santa Fe than in Boston, so she looks for something else to rent. She spends a year looking, but finds nothing. Healthy houses are a scarce commodity indeed. is not her normal eloquent self. Then, finally, by being flexible and with a lot of work and help from friends, she is able to renovate an existing house and make it work. Homesick is an excellent description of what it is like to have MCS and how difficult it is to find or create a place to live that does not cause sickness. The movie is a great tool to show friends, family and doctors who doubt MCS is such a big deal. It is very educational and not shrill, preachy or depressing, despite the many tough stories. As Susan Abod says herself, those who make it to the Southwest and manage to get a home they can live in are the lucky few. Many more are left behind in decrepit situations. Several still photos are shown in the movie, most of which come from the picture book The Dispossessed, by Rhonda Zwillinger. 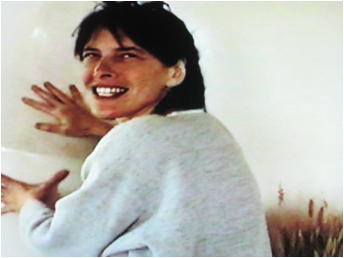 Zwillinger and her safe house in Arizona also appear in the movie. Homesick is not a tutorial on how to build or modify a healthy house, but it shows the breadth of the possibilities, including some options for people of modest means (such as steel shacks, renovated trailers, tents, vans, etc.). The movie was released by Dual Power Productions in 2013. The DVD is subtitled, which is unfortunately rare for documentaries (and much appreciated by those who need subtitles, including this reviewer.) The DVD can be watched with any DVD player, regardless of country. It does not have any regional restriction. Reviews of books and movies about environmental illnesses are available at www.eiwellspring.org/booksandreviews.html.